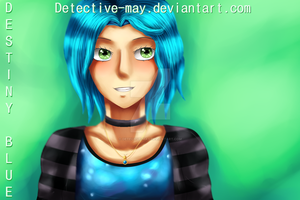 Destiny Blue is one of my favourite artists here so I naturally decided to paint her. I wanted to do black and white, but she is destiny BLUE, so I decided to incorporate blue in it as well. Having met Alice herself a few times, I always notice her blue gem necklace around her neck, and often wonder if it's ment to represent something truly magical to her. 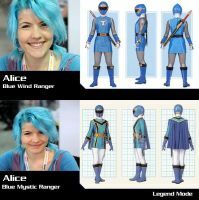 Maybe for her, it could be some kind of Morpher from 'Power Rangers' so she can morph into a female Blue Ranger, which is not a daft idea, since Power Rangers, while Blue Rangers normally are always male, have had female Blue Rangers in the past, in fact, I did an upload once where Alice herself became a Blue Ranger in different forms. Met up with her recently all three days of last months London MCM Expo / MCM London Comic-Con event.